Elsa from Disney’s Frozen, Elphaba from Wicked, Tevye from Fiddler on the Roof, and Cinderella from Into The Woods — all guest speakers in my Adult Development discussion section at the Harvard Graduate School of Education this year. Adult Development is a course taught by Professor Robert Kegan that explores what’s called constructive-developmental theory (CDT), a framework for understanding how adults make sense of the world around them. According to CDT, the capacity of a person’s sense-making system typically matches the demands of his or her environment. At times, however, the demands placed on an individual outweigh his or her capacity to make sense of them. Consider a few archetypical examples: A daughter is torn between her personal wishes and the expectations of her parents. A middle manager is feeling squeezed between seemingly contradictory demands from above and below. A leader struggles to make a necessary but unpopular decision. It can be physically painful when we face a situation that demands more than we currently have. Often, we feel it in our gut. We feel stretched, torn, stuck, or even sick. These feelings may compel us to retreat, kicking the can down the road; we may try to ignore feelings of anxiety, confusion, or frustration. But for people in positions of leadership, these are rarely sustainable options. In fact, increasing one’s own capacity to deal with complexity is critical to leadership. Characters in musicals frequently find themselves in conflict — a necessary condition for development. Characters in musicals often develop new ways of making sense of their world, so we are able to see what a developmental transition can look like. Characters in musicals make their thinking explicit through the songs they sing, so we are given a glimpse at how they make sense of the world. Characters in musicals are frequently in over their heads (which happens to be the title of one of Kegan’s books on adult development). They’re experiencing demands that are far more complex than what they have previously experienced. Elsa and Elphaba are both trying to figure out where they belong, torn between what the world expects of them and what they feel inside. Tevye is trying to reconcile his commitment to his Jewish faith and his daughter who is leaving home with a man outside of his faith. Cinderella is rethinking what she wants, unsure if palace life is all that she hoped it would be. Each is struggling to make sense of a world that no longer seems to make sense at all. We can see these characters constructing meaning differently than they did before. And we can also see how these new ways of thinking can open up previously unimagined possibilities. 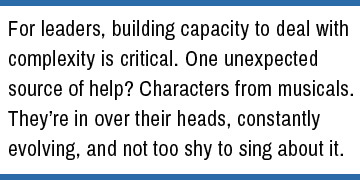 For the purposes of constructive-developmental theory, it is not enough to know what characters think or do. We need to understand why they are thinking or doing it. These moments in musicals give us precisely this opportunity — a glimpse into someone else’s head. By bringing these moments and these characters alive in my classroom, I was able to give students a new entry point into an otherwise complex topic — and a new lens onto their own personal development. And like most of the best classroom moments, we had some fun in the process. Public displays of excellent student work should be the rule, not the exception.